A friend was having a much needed clear out recently and was getting rid of some of his old vinyl records. 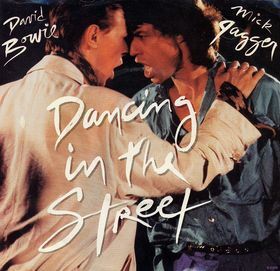 Knowing I'm a big David Bowie fan, he gave me his copy of 'Dancing In The Street' by David Bowie and Mick Jagger. Sadly I don't have a record player anymore so can't play it at the moment but I do really like the cover picture. I have never really thought about record covers being cheap works of art before but I have now decided to raid my own vinyl collection and have some of the best ones framed as pictures.